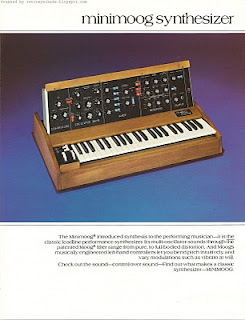 Moog Minimoog synthesizer reference sheet from 1980. This sheet is a member of the family of Moog reference sheets from 1980. 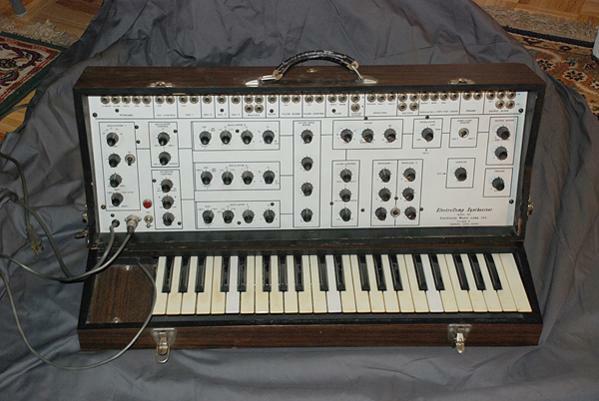 I blogged about the Polymoog reference sheet from the same series last February. 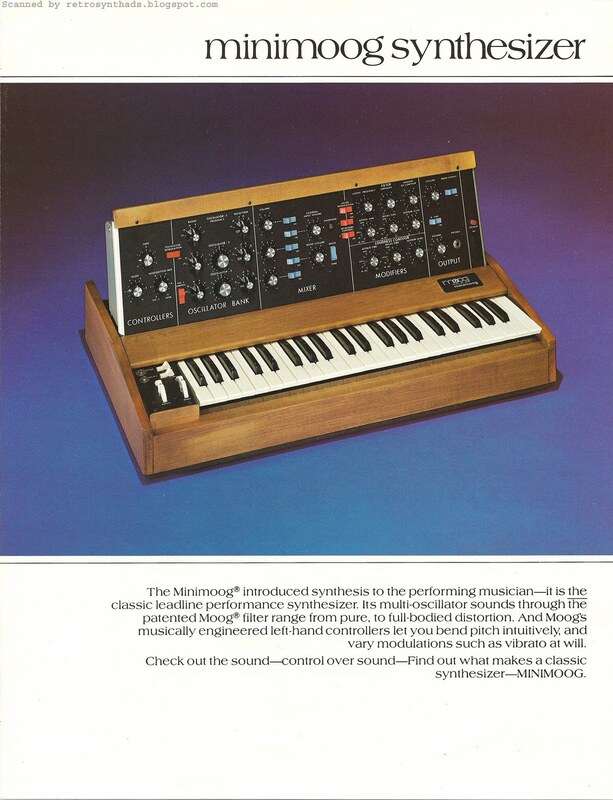 Similar to the Polymoog sheet, I've seen links to low resolution scans of the front of this Minimoog reference sheet around the Web (everyone loves a great picture! ), including synthmuseum.com. But not the back of the reference sheet- which in my opinion, contains all the juicy nuggets of great information that we love. And when I say 'we', I do realize I am probably referring to me and two other people. Maybe that person in Churchill, Canada that keeps showing up in my stats. And maybe the person from Kiev, Ukraine. Seriously, though - I really do appreciate everyone for taking time out of your busy schedules to read my blog. The front of this reference sheet stands out for one reason (well, apart from the great photo) - the ad copy includes the term 'musically engineered'. 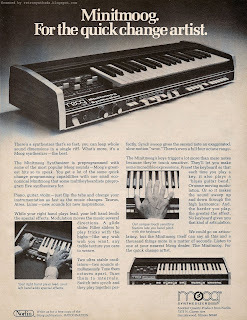 Moog had been using the term 'musical engineering' to describe their gear for quite a while by this point, including this 1977 advertisement, and in my opinion, at least partly in response to ARP's buzzword 'human engineering'. Even Octave Electronics got in on the 'engineered' action with their Cat SRM reference sheet. But the back of the reference sheet is where the fun begins. Unlike the Polymoog sheet, the top of the Minimoog sheet includes a wire frame outline of the front panel, pitch/mod wheels, and top view. I really dig wire frame outlines but unfortunately only some of the reference sheets in this series included them. They seem all scientific or something. Even the Octave Cat SRM reference sheet I mentioned above also included a wire frame outline. Most two-sided reference sheets I've come across include a wire frame image on the backside. Probably because it is a lot cheaper than printing another colour photo. Plus, there just isn't the room for a close-up of the panel in a two-pager. Many of the four-pager fold-out reference sheets I've come across like the one for SCI's Prophet-5 (will post in the near future) had the space to include a close-up of the panel on the inside pages rather than a wire-frame outline, while one-siders like ARP's Odyssey sheet (another future post :o), only included the front photo due to even greater space constraints. I can't explain the two-sided ARP Soloist Mk II sheet I've posted in the past - it definitely had the room on the back for a wire frame outline, even though it doesn't really follow the standard 'reference sheet' format. But definitely a missed opportunity in my opinion. Aries Music Inc. modular synthesizer advertisement from page 48 of Contemporary Keyboard Magazine July 1977. Between spending time doing a stint at a tradeshow booth, attending an art auction (that included eating lots of cupcakes) and some marathon Fallout 3 sessions, it has been a busy week. But I remembered coming across this quarter-page advertisement from Aries while flipping through CK the same time I had come across that Oberheim SEM Evolution full pager earlier this month. This ad only appeared once in the July '77 issue. 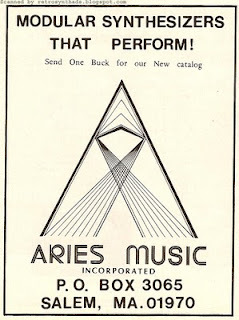 I had overlooked this advertisement when I blogged about this early Aries ad, so I was quite excited to come across it. I haven't seen it online either - maybe because, surprisingly, the ad doesn't include an actual photo or image of an Aries modular. To me, the prismatic-inspired 'A' symbol really did a great job positioning Aries both artistically and technically. Robert Leiner, owner of the most comprehensive Aries Web site I've ever come across, calls the logo 'spiffy'. I have to agree. There is one problem with this ad that really gets under my skin. You see, the logo pulls my eyes upward, directly to the only ad-copy in the advertisement. From a design perspective this is great - Zenbecca commented on this aspect of the logo in my previous Aries blog post. But from a grade-10-grammar-teacher perspective, the sporadic use of capital letters would get your hand slapped with a ruler pretty quickly. It may be the smallest text in the ad, but now, whenever I look at this ad, all I see is this sentence. My irritation with capitalization disasters is a pet-peeve that I picked up over twelve years ago when I first started working in a communications and public relations department. My boss used to get mad at me all the time for not capitalizing properly. I don't claim to know all the rules... but I know the text above is breaking a few of them. And don't you dare go back to old blog posts to see if I have been consistent. Because I probably haven't. But then again, my boss doesn't see these posts. 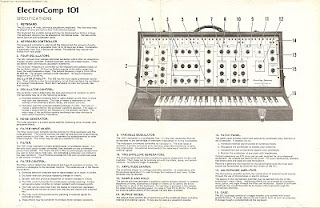 EML ElectroComp 101 brochure from 1976 (estimated). Okay - I think I've let enough time pass that I've gotten over my little obsession with EML advertisements that I blogged about in December 2009. This ElectroComp 101 brochure has definitely seen better days, but since I've only ever seen the front page of this brochure online, I thought some people might find the rest interesting - especially those interested in the specs of this machine. But, before I get to the specifications listed on the inside of the brochure, I just have to make a few comments about the front page. First - take a look at the image of the ElectroComp 101 on the front (and on the inside). 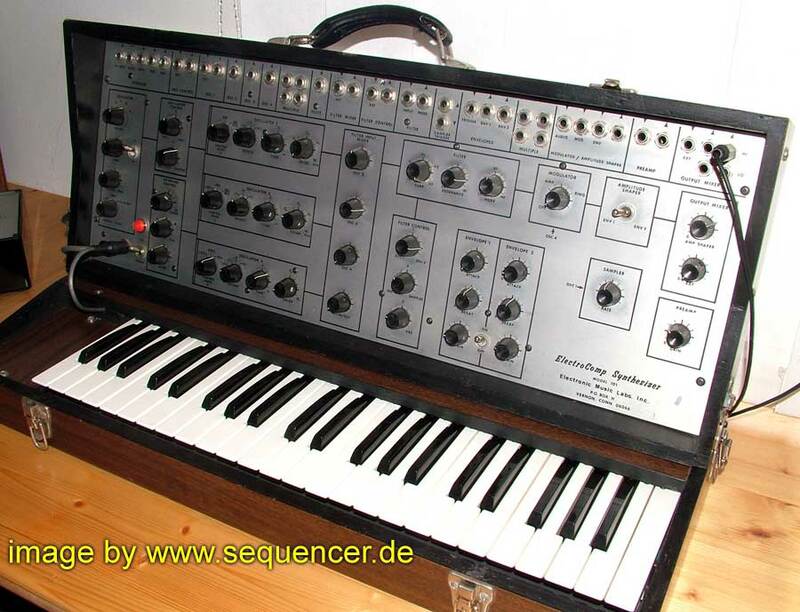 They look normal enough, but, if you do a quick Google-images search for this synthesizer, you will notice that many of the other images of ElectroComp 101s that you see on the 'net have one extra feature. You will notice two cords running out of the bottom left-hand corner of the front panel. This flickr photo has at least one other customized cable running from it. Even the EML advertisements I've featured on my blog have that second cable. I'm not at all familiar with this synthesizer, so someone else is going to have to clue me in. Mark Vail's book 'Vintage Synthesizers' does suggest that over the ten-year life span of the 101 there were some internal improvements made, but "the functionality of the instrument remained about the same from day one". So, what is this second cable? Second, and more fascinating, is the style of writing used on the front page. Even EML admits it - the text on this page is very 'cocky'. Best this..., best that.... EML 'gives' us the best... .
That is a far cry from the ad-copy that is found in the advertisements in Contemporary Keyboard magazine where they are much more laid back - kinda like 'hey, if you are checking out synthesizers, you may want to check us out too'. 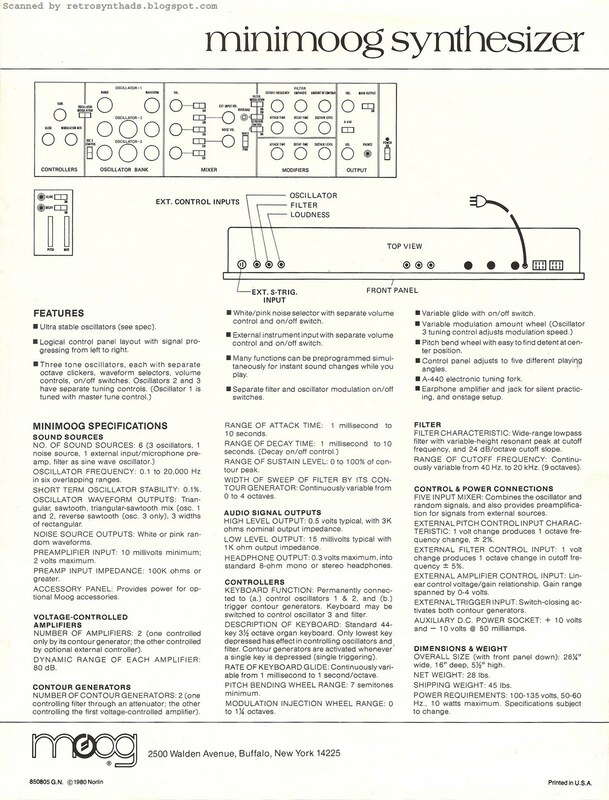 But, read through the specifications section on the inside of this brochure, and you start to think that maybe they have reason to be cocky with all the features they have crammed into this little beast of a synthesizer that went for under $1500 at the time. Four oscillators. Sample and hold. Multi-mode filter. External input. And most importantly - a patch panel! This really is quite the synthesizer! Who knows... maybe I'm just too easy on 'em. End note: before I sign off, I just have to comment on the fonts used in this brochure. 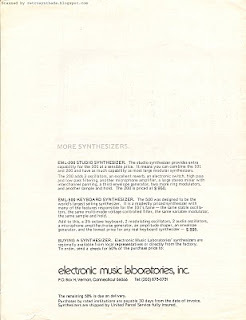 I've stated before how much I love the font used for company name - 'electronic music laboratories inc.'. You can see this font in action on the back page of this brochure. But, I gotta say, the font used on the bottom of the front of this brochure for the text 'ElectroComp 101 $1495' is also fantastic. Seriously. If nothing else, EML was a funky company. I don't think I've seen EML use this font before, so I'll have to check my other EML reference sheets/advertisements for more evidence of the use of this font. Oberheim Synthesizer Expander Module (SEM) Evolution advertisement from page 31 of Contemporary Keyboard Magazine July 1977. I was flipping through CK looking for something different and boy, did I find it. Another great advertisement from Oberheim. And rare - looks like it only appeared once in CK and I have never come across this advertisement online. 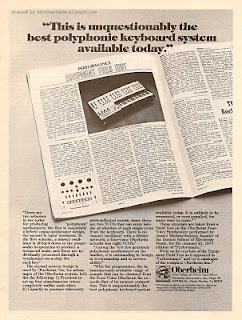 So, Oberheim had been doing quite well with the look and feel of their late '76 ads like the Polyphonic Synthesizer Programmer and SEM, so why mess with a good thing? Here's my theory - Moog had just started some gorilla chest-pounding in the May 1977 issue of CK with their 'blunt and totally biased viewpoint' ad and I would bet this ad was the sound of Oberheim howling back through the jungle foliage. 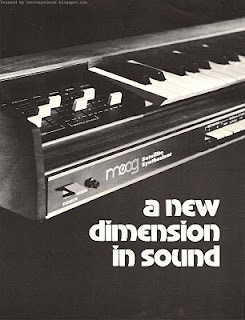 Check it out - one of the main themes flowing through the Moog advertisement from two months earlier is 'First'. How they started it all with their voltage control. 'First came the multiple waveform voltage controlled oscillators...' and then 'the first four-part ADSR envelope generator'. Finally, near the end, they talk about their 'first polyphonic synthesizer'. 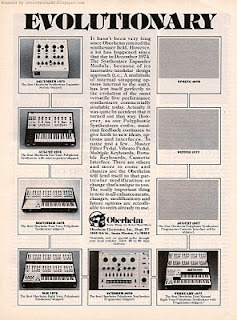 The same word - 'First' - appears in every instrument box of this Oberheim advertisement as the time line runs through the evolution of their system. And after this ad ran once, Oberheim went right back to gear ads. It's like that little sixteenth note in the Oberheim logo took a swing back at Moog and then kept walking on its merry way. I love that logo. And while I'm on the subject, I wouldn't be surprised if this Oberheim advertisement inspired Oberheim's 10-Year Anniversary advertisement three years later. The same theme - 'First' - runs through the ad-copy there as well. Okay, maybe it is just coincidence. There were a lot of 'firsts' coming out of the synthesizer scene at the time. But it is fun to wonder. As far as the ad itself goes - for the most part I really dig it. I love reading through the evolutionary time line they provided. Even better, it also lets us in on the next piece of gear to come out while leaving two future boxes blank to help build anticipation that there is more coming on the horizon. Anyone guess what those two future items were? The only thing I don't like about this ad is that it feels a bit too crowded, mostly because the text in the middle is hard to read. I bet most people didn't. But you should. 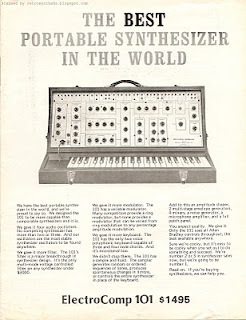 One nugget of text I did like in the ad-copy was the fact they admit that it was 'quite by accident' that the SEM's modular design 'lent itself perfectly to the evolution of the most versatile live performance synthesizers'. Gotta love honestly in advertising. 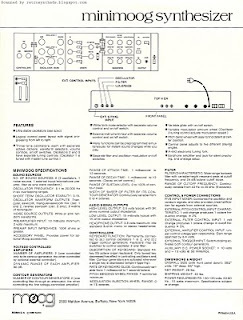 ARP Avatar Brochure from approximately 1977. Oh, come now - calling me predictable? Okay, I admit it. I'm writing this on Sunday afternoon and can you guess which movie I hope cleans up at the Academy Awards? 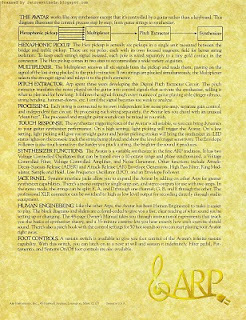 What you see here is an apparently rare four-page ARP Avatar brochure with a sound sheet attached to the third page. Bits of the imagery, photo and text from this brochure appeared in magazine ads around the same time period. You will notice that I've gently bent back the sound sheet on page three (looks like a black bar in the scan above) so that you could get a good look at the full text and, even better, the 'rock god' image with 'play like a god' written below it. And what an image it is. In fact, what a brochure it is. 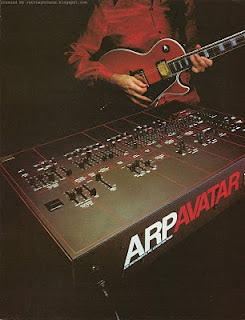 Looking at the imagery really gives you an idea of what ARP was thinking when they launched this guitar synthesizer. 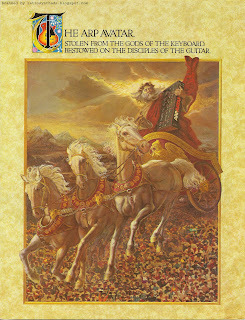 The pseudo-biblical imagery and text throughout the ad-copy tells us that ARP really thought this was the big ticket. The next big thing. Or they were at least hoping guitar players would. "Everybody thought it was going to be the hottest thing since the wheel." 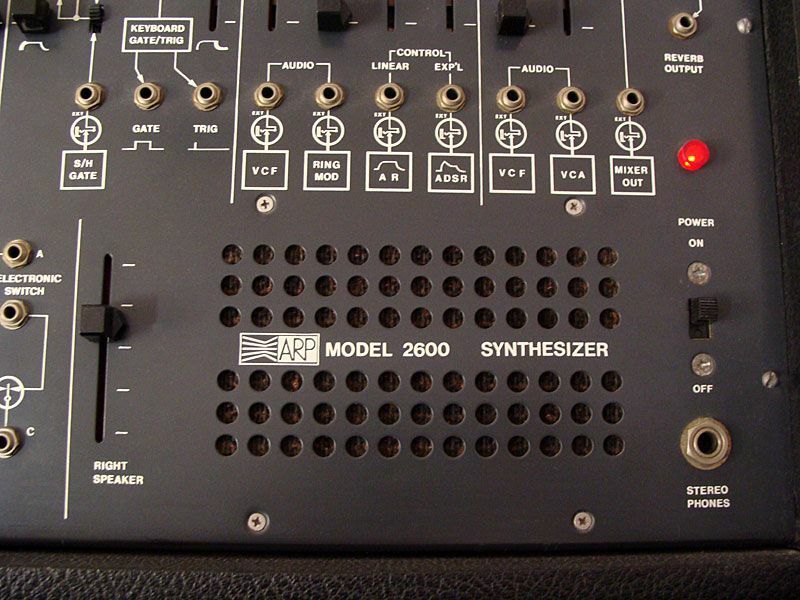 ARP risked millions developing the Avatar and in the end it was "imperfections of the pitch-voltage converters" (the mechanism that converts the vibrations in the strings into signals for the synthesizer) that brought the instrument, and according to many, the company, to its knees. 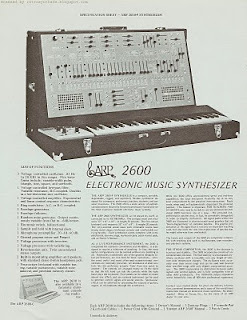 "And so it came to pass that guitar players would have the same performance potential as keyboard players, for the new ARP Avatar would provide it." Maybe I'm wrong, but I'm pretty sure most ego-centric guitarists, at a time when synthesizers were just starting to take away some of the spotlight, may have thought they had much more 'performance potential' with their axe, jumping around the stage and such, than a synthesizer could provide. To me, it is not an in-your-face diss, but it is a subconscious (albeit not intentional) one. Maybe even a touch condescending (again, not intentional) on the part of ARP. Don't get me wrong, I still think the idea of a guitar synthesizer is a good one. But whether the Avatar should have been the one to bring it to the studio is the question - so judge for yourself. Joseph Rivers from the Audio Playground/Synthesizer Museum has ripped the same sound sheet that is attached to this brochure on the synthmuseum.com Web site. 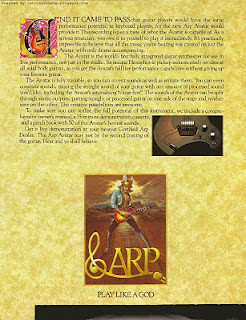 Also questionable about the brochure is the fact that there isn't an ARP logo to be seen on the front page and the 'ARP AVATAR' text on the back of the instrument in the image is pretty dang small. Maybe they thought 'ARP' wouldn't be recognizable to guitar players, but then it would probably be even more important from a branding perspective to get your logo out in front of your new audience. One other thing - if you look closely at the audience on the front page, you will notice five or six guitars comp'd in there. Pre-Photoshop even. Incidentally, the first two songs on the song sheet are credited to Ned Liben at Sundragon Studios in New York. Ned Liben was one half of the band 'Ebn Ozn' - I was just listening to their hit song 'AEIOU' on my MP3 player at the gym! According to Wikipedia, Ebn Ozn's claim to fame was that they created 'the first American album ever recorded in its entirety on a computer - a Fairlight CMI - and the only band to have written and produced their own videos in their time'. Huh. Now, time to watch the Oscar red carpet. 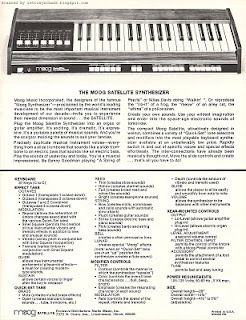 Moog Satellite reference sheet from the 1970s. Seen this reference sheet on eBay a couple of times recently - but I haven't run across a higher-res scan of it on the InterWebz. It is a great piece - from the stylized photo and rounded font used on the front side, to the creative use of text (crazy adjectives and name dropping!) and reference information on the back! 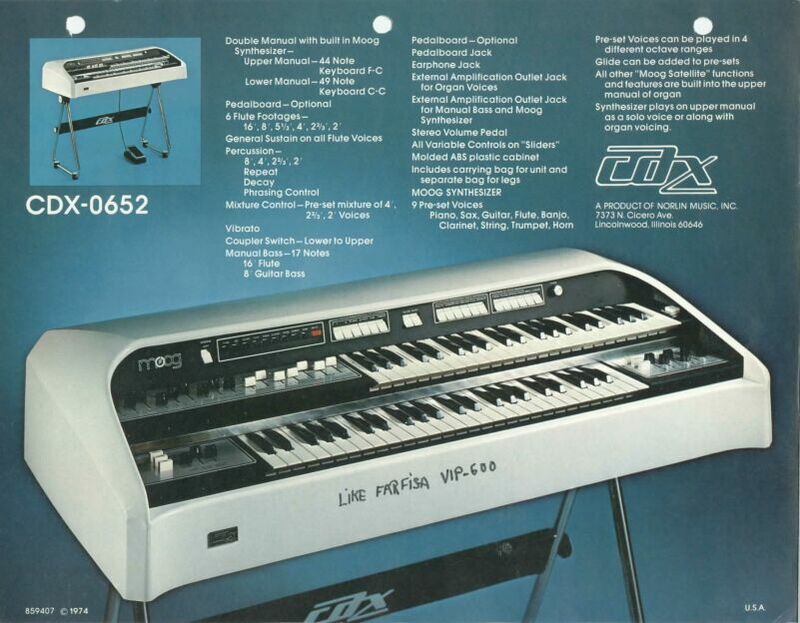 There is unfortunately no date on this reference sheet, but the opening text introduces this keyboard as their 'newest dimension in sound' suggesting it may have come out early on in the Satellite's production run. Comparing it to other Moog sheets, the design doesn't match Moog's family of reference sheets from 1975 or 1980. The Satellite is a single VCO preset synthesizer that was apparently built by Moog to compete with the ARP Pro-Soloist (read my blog posts on the Soloist, Pro-Soloist, and Soloist Mk II if you are not familiar with that run of keyboards). Surprisingly, the Satellite's production run went from approximately 1974-1979, while its more powerful dual VCO sibling, the Minitmoog, was introduced in 1975 and only lasted for a year or so. The Minitmoog didn't just offer up twice as many VCOs either, it also offered up more than twice as many presets. The Satellite's presets included Brass, Reed, String, Bell, and Lunar, while the Minitmoog up'd the ante by including Trumpet, Oboe, Clarinet, Sax, Taurus, Violin, Piano, Guitar I, Guitar II, Aries, Lunar and Flute. So why the quick demise of the Minitmoog? Just a few minutes on Google will tell ya - it just wasn't built very well and there were major issues with its aftertouch. But, enough about the Minitmoog - and back to the Satellite. The book 'Vintage Synthesizers' by Mark Vail (the chapter 'The Rise & Fall of Moog Music' written by Connor Frerr Cochran & Bob Moog) offers up a great anecdote about the Satellite and how it fit into the sale of Moog to Norlin. As the story goes, when Moog Music showed the Satellite at NAMM in 1973, it was definitely a hot product but wasn't in the production queue yet. So Moog Music decided to sell the rights to build Satellites instead of building them in-house. The Thomas Organ Company bought the rights to build 5,000 Satellites for a royalty of $75 a piece, and also built Satellites into its organs for $15 a piece. This apparently came out to a wholesale royalty of around 40% - astonishingly higher than the usual 5% seen in the industry at the time. $375,000 of income from the royalties showed up on Moog's income and expense statement that year creating an operating profit of 25% for Moog Music. Again, astonishingly high. Norlin, not realizing this was a one-time event, apparently ended up buying the company based on these numbers. I love a good anecdote. For some great close up shots of a Satellite in great condition, check out this Web site . 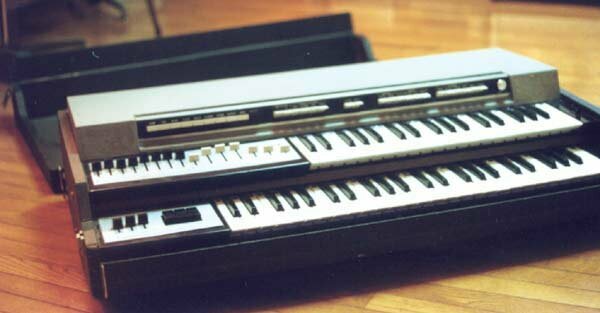 You can also find some more information on the combo organs that sported the Satellite on, where else, but combo-organ.com. The Satellite was slapped on to at least a couple of different models, including the extremely space-age looking Cordovox CDX 0652 as well as the not-so-space-age looking Thomas/Moog organ.